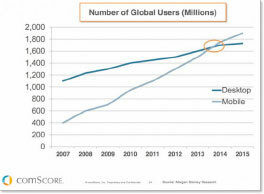 Google reports that more searches are now done on a mobile device than on desktop computers. Those of us with smartphones are using them while on the go and we’re often searching for information about businesses in the area. Based on the growing popularity of mobile search Google made another adjustment to their mobile search algorithm in May 2016. You’d think that every business would have a mobile friendly website by now, but that’s not the case. And since Google has almost 70% of all search traffic it might be a smart move to pay attention to what they say and do. Just look around you – pretty much everyone has a mobile device. And they use it all the time. This Inc.com article has some in depth data on why Google is updating the mobile algorithm and what you need to focus on. A recent study of the Inc. 500 websites shows that 22 percent don’t pass the Google mobile-friendly test. Optimizing your website for mobile search is vital for a local business. It’s highly likely that people in your vicinity are searching for the products and services you provide and if you don’t show up when they do a search on their phone, you’ll miss out on that potential customer. And it’s not only important to retail or B2C businesses. The profile of B2B buyers and researchers is changing. Almost half of B2B buyers are now Millennials. They’re smart and they’re wired. They all use smartphones & tablets to do their work. Google’s data shows that 42% of all B2B buyers use a mobile device to start their search for information prior to purchase. The new update means that without a good mobile site you won’t have good search visibility on a mobile device. 57% of internet users say they won’t recommend a brand with a bad mobile site and 40% say they turned to a competitor’s site after a bad mobile experience. Every website should be fully responsive. That means the site can detect what device you’re on & adapt the content to fit the format. And you need to think about the visual impact of your content on mobile devices too – smartphone screens require images 2X higher res than desktops. A fuzzy, pixelated, hard-to-navigate mobile site will turn users off. What you need is content that is 10x better than your competitors and that takes a content strategy based on data – you have to know your audience and know what they want, as well as what they respond to. Content for content’s sake is just more internet litter.